How sad that after 43 years in the cockpit of the European project Britain finds itself at the exit door. This decision will have major consequences for its economy: Britain will likely experience a prolonged period of tumultuous financial and economic uncertainty, while at the same time facing the massive undertaking of renegotiating bilaterally all its trade agreements both within and outside Europe. In all the years I have been studying and observing the European project it always seemed there was just one possible direction - expansion and integration. But today there is a real risk that this is the first step towards exodus and disintegration. This will hurt Britain. But mostly it will hurt Europe and the world if nothing is done to stem the flow. European integration has major historical significance. The fundaments of the EU were created for political and security reasons, not economic ones: in the 1950s, and with WWII fresh on the mind, Europe bound its economies together, first through coal and steel, to ensure that there would be no war ever again in the region. The idea of an ever closer union had strong appeal. Beyond security it increasingly represented clear business and economic opportunities for new members. Wave after wave of often poorer countries with shorter democratic histories joined the club, grasping the chance to expand their economies and the opportunities for their citizens. Europe grew larger and richer over the years. At university in the US in the late 1980s and early 90s I observed this integration process with fascination. This was a time when the Cold War came to a head and the Soviet Union ultimately collapsed and rapidly started to unwind. The European project—at that point well under way—was a beacon for democratic integration and an important alternative future. Not surprisingly it became a magnet for the eastern European countries as they returned to the global fold. And indeed since its creation there have been no military conflicts between member countries, which are now all vibrant democracies. Europe became in many ways an important example of integration, opportunity and hope that others could follow. Ever closer union seemingly had not just a logic but also a certain inevitability on its side. While ever closer union had intellectual appeal, over time it simply didn’t resonate with the average citizen. Europeans also started to take for granted the benefits of integration as they became all too familiar. Meanwhile, as more and more countries joined the project, somehow the architects in Brussels seemed to grow increasingly distant from the needs and concerns of regular people. Although still only wielding an overall budget of about 1% of European GDP, Brussels exercised more and more policy-making power, led by an unelected executive branch. The Commission drew up laws that had real impact on people’s lives. Over time, as the laws grew and grew, this gave the impression that more Europe was an end in itself, rather than a means to an end for greater security and prosperity for its citizens. Perhaps not surprisingly, national discourse turned more and more to the threats emanating from Brussels rather than the opportunities of integration. And national politicians had found their perfect scapegoat and punching bag for any difficulties they were facing. After the last major accession of countries from the former Soviet Bloc, the project increasingly lost its popular appeal, attracting smaller and smaller turnouts to European Parliamentary elections. There were also successive rebukes to its power, such as the Danish rejection of the Maastrict treaty, and the French and Dutch rejection of the European constitution. In the meantime the euro crisis has underlined that Europe is not an optimal currency area; and the inability to deal with the recent refugee crisis threatened to roll back progress on the free movement of people, particularly in the Schengen area. And finally perhaps the most serious issue is inequality. Recent decades have seen a significant increase in income and wealth inequality across many advanced economies and throughout Europe. Unemployment, particularly among the young, has remained stubbornly high in many countries. At risk is an entire generation who will never have worked. Median incomes are not rising. Growth has simply not been inclusive, and average citizens believe that their lives and those of their children will be worse than those of previous generations. Many have concluded that Europe is to blame. 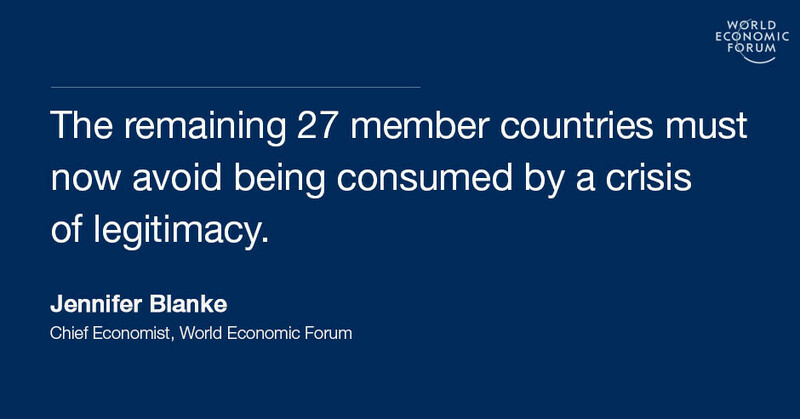 The remaining 27 member countries must now avoid being consumed by a crisis of legitimacy, and remain focused on building a better future for their citizens. Three factors will be critical not only to keep the rest of the union from falling apart, but to construct a solid future. First , Europe’s leaders must manage Brexit in a way that avoids undoing all of the work of the last 60 years. This will require ensuring a smooth exit of the UK from the union, while taking a firm line on the next steps, in order to ward off even greater euroscepticism and to deter other countries from following its lead. Discussions among the remaining 27 member countries over the next months will be decisive in laying out a plan to this end. Second , Europe’s political bodies must simplify rules and get closer to the public. For this, the EU requires a more open, democratic and transparent EU decision-making structure to restore the European project’s credibility. Europe’s citizens must have more say in the democratic process, which in turn must be more open to a variety of perspectives. Only by engaging citizens in what now seems like a very distant and elite process managed from Brussels can the EU also respond to the rise of populism and anti-Europe movements. Third and perhaps most importantly, Europe’s leaders must articulate why an integrated future ensures better prospects than going it alone. Europeans must once again perceive the European project in terms of opportunities, not threats. This requires a new type of social compact for a very different kind of Europe. A Europe of hopes and dreams of a better future as it once was. One that takes into account seriously the concerns of its citizens, and attacks head on the inequalities both within countries but also across the Union. The younger generation of the UK—who we must recall voted to remain in the EU by a large majority—no longer has the opportunity to benefit from the positives of integration. It is up to Europe’s leaders to ensure that the young in the rest of Europe can continue to count on such a future, one that responds to their aspirations to build a prosperous and secure region that all Europeans are keen to preserve and nurture.